So Christmas is in just a week and with you’ve bought all your gifts, you’ve ordered all your food, but now you’re in a panic as you have no idea what to wear for the day that only comes around once a year. On top of that, all your relatives are coming to yours and you obviously want to look your jolly best. Well you’re just in lucky, as Girl Meets Dress has got your back, we’ve composed a list of dresses to hire suitable for the day! Self-Portrait has a way of creating the perfect party dresses – This red floral lace midi dress reveals just the right amount of skin, with skinny straps, an open back and a midi skirt. A lining stops to reveal the legs beneath. Self-Portrait has a way of creating the perfect party dresses – This black sheer floral lace style reveals just the right amount of skin, with skinny straps, and a full midi skirt. This midi dress, is perfect for either a day or evening event, so whether you’re having a Christmas lunch or dinner, this is the dress to hire! Want to be the centre of attention this Christmas? Then why not hire this gold prom dress. This gold dress features Sequin V front full skirt dress with back zip fastening by Rare London’s brand Opulence England. This gold dress is a must have for Christmas. Want to sparkle this Christmas? Then why not rent a grey dress from Alice + Olivia. The reason this grey mini dress is on the list is that we love the hint of seductive detailing at the back of this metallic soft, sequined dress from Alice + Olivia. Team with black ankle boots or knee high boots and metallic accessories to complete your look. If you are going to church on Christmas and don’t have time to change to a more festive dress, this white dress is the one for you, as you can either let the simplicity of this white dress do the talking or add some festive accessories. Its the right amount of conservative – long sleeved accompanied with a flattering feminine A-Line skirt. The clever detail around the waist contours the shape to create a stunning silhouette. Is your Christmas Dinner a black tie event? Well then you are just in luck, as red is such a great colour to choose for a black tie event. Rent this red evening dress for a modern glamour statement at your Christmas Dinner. The beautiful fabric is adorned with beading. Keep accessories minimal. 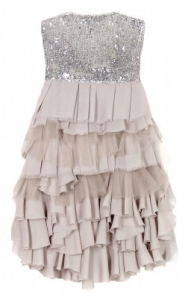 Order before 12pm 21st December to wear the dress of your dreams! Tags: GMD Daily. Alice + Olivia, Alice + Olivia dress, Alice + Olivia dresses, Dresses by Lara, Dresses by Lara Gowns, Dresses by Lara UK, gold dress, gold dresses, Hire Alice + Olivia, Hire Alice + Olivia dress, Hire Alice + Olivia dresses, hire dresses by lara, Hire Gold Dress, hire gold dresses, Hire Opulence England, Hire OPULENCE ENGLAND dress. hire OPULENCE ENGLAND dresses, hire self portrait, Hire Self Portrait dress, hire self portrait dresses, Hire Self Portrait dresses in Europe, Hire Self Portrait Dresses in the UK, Hire Self Portrait in London, opulence england, Opulence England Dress, Opulence England Dresses, Rent Alice + Olivia, Rent Alice + Olivia dress, rent alice + olivia dresses, Rent Gold Dress, rent gold dresses, Rent OPULENCE ENGLAND, Rent OPULENCE ENGLAND dress, Rent OPULENCE ENGLAND dresses, rent self portrait, Rent Self Portrait dress, rent self portrait dresses, Self Portrait, Self Portrait Dress, self portrait dresses.